The post mourning Vicky’s death, has Veera posing with a weapon in his hand, as he has announces his intention to kill those who killed his ‘brother’. 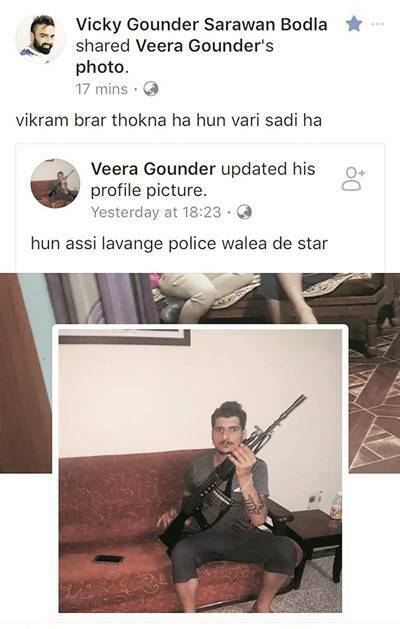 Four days after Punjab Police shot dead wanted gangster Vicky Gounder in an encounter, a Facebook post by one Veera Gounder has issued an open threat to Punjab Police. Vowing to avenge the death of his ‘brother’ Vick Gounder, Veera, who claims to be a sharpshooter from Nahan in Himachal Pradesh and presently living in Shimla, has threatened to kill Inspector Bikram Brar, operational head of Punjab’s Operational Crime Control Unit (OCCU), who led the team which killed Vicky Gounder. The Facebook account is also flooded with photographs clicked in jail, police station and in some ‘selfies’, Himachal policemen can also be seen smiling and posing with him for a selfie. He has also posted many pictures from Modern Central Jail, Nahan. Himachal Pradesh police has identified ‘Veera Gounder’ as Anuj, a 24-year-old undertrial in a drug smuggling case who was lodged at Nahan Jail under NDPS Act and got bailed out on January 4. Earlier, he was booked in a theft case and got bailed out in July last year. He is originally from Sirmaur. Punjab Police suspects that Anuj changed his name to ‘Veera Gounder’ for some ‘publicity’. “These gangsters keep on changing their names on social media. Motive is to join some well-known gang and now this Anuj who till now was a petty criminal, wants to get associated with something big like Gounder gang. There is no blood relation among the two. Vicky Gounder was the only son of his parents,” said a senior Punjab Police official. “We are taking all necessary precautions for our officers who were involved in the operation. We are doubtful if the weapon that this Veera Gounder is holding in the photo is real. Our social media team are on it. We are coordinating with HP police,” said Gurmeet Singh Chauhan, AIG, OCCU wing Punjab. Another post on Vicky Gounder’s account referring to Veera Gounder’s post said on Monday, “Vikram Brar thokna hai hun vari sadi hai. (Now it’s our turn to kill Bikram Brar). Inspector Bikram Brar said, “I have only performed my duty and will continue. There is no question of any fear.